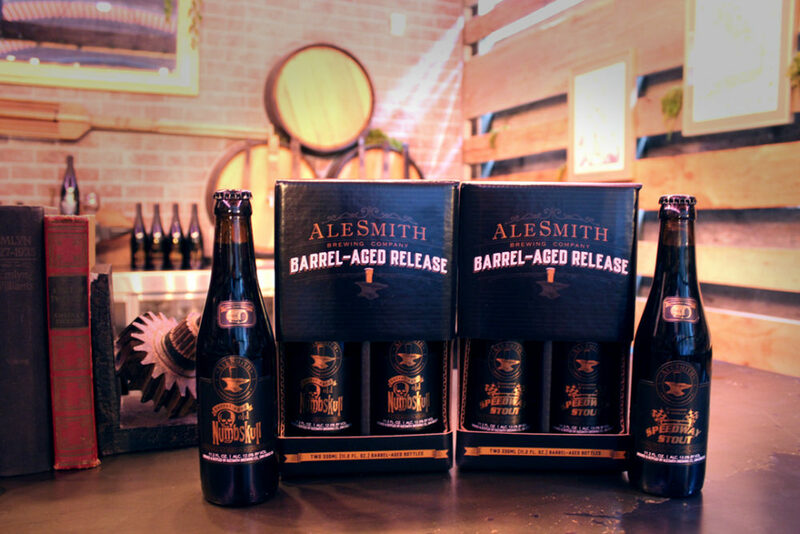 (SAN DIEGO, CA)8 – AleSmith Brewing Company is offering a new way to enjoy the classic European-style brewery’s barrel-aged beers. To make these popular styles more accessible to the casual imbiber, they recently released a new Cinnamon Vanilla Barrel-Aged Speedway Stout and already popular Barrel-Aged Old Numbskull in 330 ml (11.2 oz) bottles. Packaged in custom “Barrel-Aged Release” two-packs, these higher ABV beers can be enjoyed more easily by an individual consumer as compared to the traditional 750 ml bottles that AleSmith has provided in past years. The Cinnamon Vanilla Barrel-Aged Speedway Stout, with its 13% ABV, is a blend of two different versions of AleSmith’s award-winning Speedway Stout, each going through its own unique aging process. The first part of the blend was aged in American oak bourbon barrels; the second part of the blend was aged in bourbon barrels that had previously held cinnamon and vanilla extract. After aging, these two parts were blended and aged again with vanilla beans and cinnamon sticks and given a dosing of locally roasted coffee. The effect is a full-bodied brew with complex notes of chocolate, coffee, vanilla, and cinnamon. A staple of the traditional AleSmith barrel-aged lineup, 12% ABV Barrel-Aged Old Numbskull, has also been bottled in the updated design. This bourbon barrel-aged variation of their classic barleywine went through a lengthy aging process in freshly used American oak bourbon barrels. The resulting malty brew boasts notes of caramel, toffee, vanilla, coconut, and oak. Limited quantities of these 330 ml (11.2 oz) releases are available for purchase in mix and match packs of two only at the brewery. Visit http://www.alesmith.com/specialtyreleases for information on all current AleSmith limited time offerings. Forged in 1995, AleSmith has been recognized by consumers and critics alike as one of the world’s foremost craft brewing companies behind accolades that include medals won at prestigious national and international beer competitions. In addition to being well established within its hometown of San Diego, AleSmith was acknowledged by the RateBeer community as the Top Brewer in California and the 4th Best Brewery in the World in 2017. AleSmith also received the Champion Brewery Award for the past three years at the San Diego International Beer Competition, and was named Small Brewing Company of the Year at the Great American Beer Festival in 2008. AleSmith is celebrating its 23rd year in business and occupies a 109,942 square-foot facility with a state-of- the-art brewery. AleSmith’s range of acclaimed beers, which includes Speedway Stout, IPA, Nut Brown Ale and San Diego Pale Ale .394, is distributed in 28 U.S. states and 8 countries. Visit us at www.alesmith.com and on Facebook, Twitter, and Instagram (@AleSmithBrewing).